This is a filling snack served during festivals & when observing a fast. It is an easy and tasty vrat ka khana. Clean sabudana without mud and stones, wash gently two or three times and drain the water completely. Now pour in VERY LITTLE WATER, JUST TO COVER OR IMMERSE THE SAGO AND KEEP ASIDE FOR 2 HOURS. Rake the sago gently with a fork once an hour. After 2 hours, separate the sago pearls gently with your hand. By this time the sago would have absorbed all the water. It will be moist but no trace of water will be there. Boil and mash potatoes. Finely chop green chillies. Coarsely grind peanuts. Keep aside. Mix together sabudana, mashed potatoes, peanuts, cumin seeds, green chillies, coriander leaves, lemon juice and salt. Mix well without any lumps. Make small balls out of the mixture (It can also be shaped as patties). Heat oil in a kadai. Ensure medium heat and deep fry vadas till golden brown. Serve piping hot with ketchup or any chutney and a cup of tea. Yum Yum .....looks yummy !!! So authentic and so delicious!!!! a perfect snack!!! Hi Shanthi, this snack look tempting and yummy! Thanks for sharing the interesting recipe. Happy New Year & Have a nice week ahead. yummy ones..i flatten them usually.. these wld be more comfo..
Vrat ka khana, but very delicious evening snack; come to think of it not just evening, but anytime snack. Very nicely explained through pictures too. Nice recipe Shanti! Can this be shallow fried, if shaped like patties? Will the Sago cook? Priya if shallow fried it will be chewy. Nice Snacks Shanthi... Love this...must try. Sabudana vada looks nice and lovely. Feel like grabbing some and munching rite now, very crispy vadas Akka. 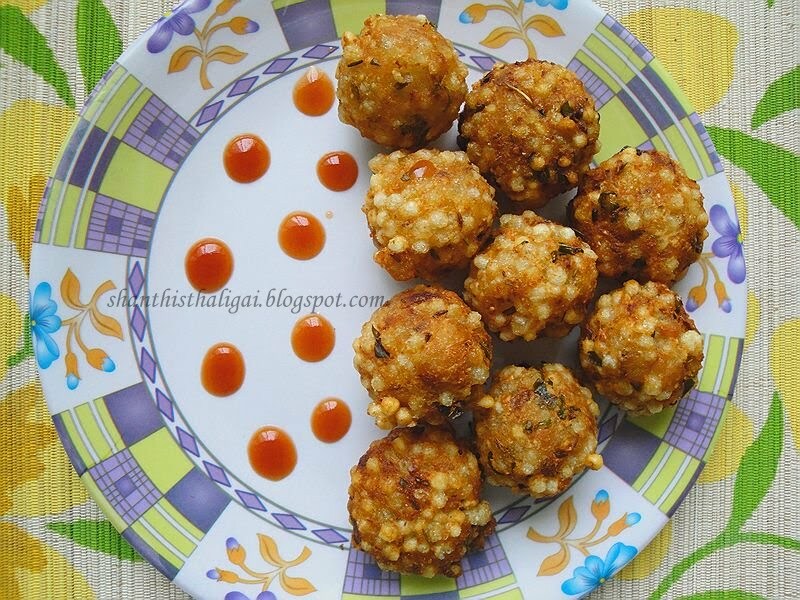 Cute looking vadas,looks so tempting,delicious one. This is one of my favs and I love the bites of peanuts in them! They look perfect.